While Microsoft officially killed its default clipart for PowerPoint a few years back, you can always opt for better and more visually appealing clipart using third-party sources. The best thing is that some of these sources are also free. 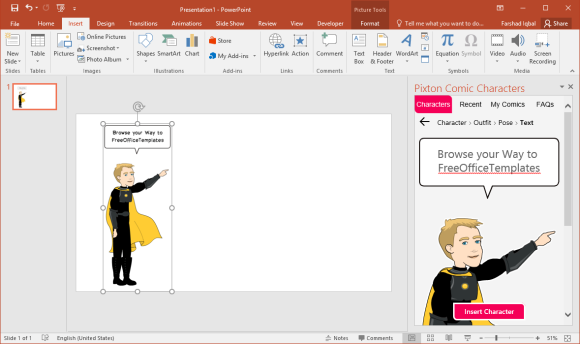 Pixton Comic Characters for PowerPoint is a free add-in which brings comic characters for Microsoft PowerPoint. You can search and add characters to your slides by simply dragging them from the sidebar in PowerPoint to your slide. 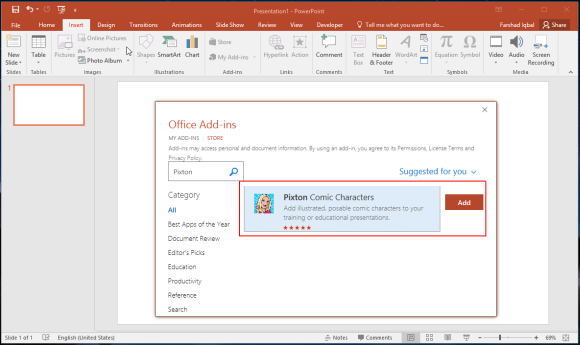 You can install the Pixton add-in either via AppSource by going to the link at the end of this post or search for it via the Office Store in PowerPoint via the Insert Tab. Once the add-in is added, you can begin inserting comic characters in PowerPoint from the right-sidebar that will pop-up. Once you pick a character, you are asked to pick an outfit and pose to add the character to your slides. This gives you the opportunity to make use of the given characters for generating comic strip like illustrative slides. You can make use of the given content to create entire PowerPoint storyboards or to simply make your slides more interesting by giving them a comic strip format. The add-in offers over 40,000 images that you can choose and insert in your PowerPoint slides. You can also customize your characters by resizing them and placing them in your slides according to the best suitable position. Since you get the choice to pick poses, you can pose different characters to design slides like a storyboard to illustrate your point with speech bubbles. 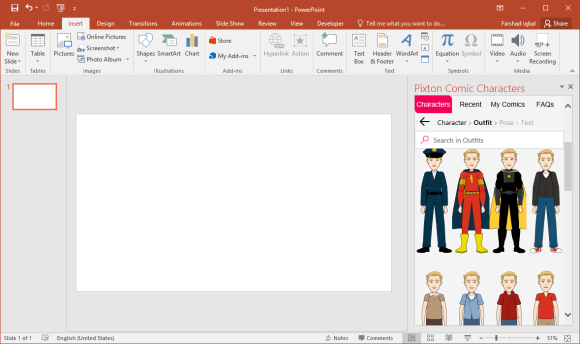 The Pixton Comic Characters add-in is compatible with PowerPoint 2013 Service pack 1 Plus versions of PowerPoint which also includes PowerPoint 2016 and Mac variants of PowerPoint. Furthermore, you can also use this add-in with PowerPoint Online.